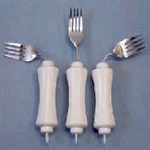 The SteadySpoon is the newest and most unique method for challenged, disabled or aged individuals to gain independence by allowing them to fulfill one of everyone's most basic needs, independent eating. 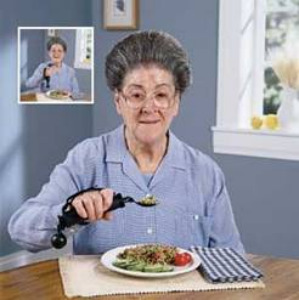 By using the SteadySpoon, with its unique counter balance and swiveling head, almost anyone can successfully bring food of any kind from their plate or tray to their mouths. 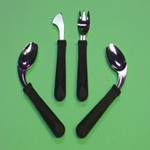 The food item will not spill or fall from the spoon, even if the hands or arm experience minor shakes or tremors, side to side or up and down. 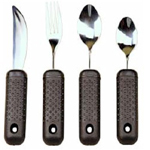 The active counter balance and weight locks the head of the spoon into a level position keeping the food stable and in place. For anyone who has ever experienced the difficulty, frustration, and pain of not having or losing the ability to feed themselves, the SteadySpoon is the answer. Please choose carefully! For hygiene reasons, the SteadySpoon Eating Utensil is not returnable!